A living piece of the country’s history, Saudi folk music has been shaped by the nomadic Bedouins and the pilgrims who brought musical influences from around the world. The music varies from region to region – for example, in the Hijaz, the music of al-sihba combines poetry and songs of Arab Andalusia, while the folk music of Makkah and Madinah reflects these two cities’ influences from throughout the Islamic world. 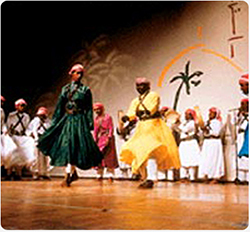 Dance is also popular among Saudis. The national dance is the men’s sword dance known as the ardha. An ancient tradition with its roots in the country’s central area known as the Najd, the ardha is a combination of singers, dancers carrying swords and a poet or narrator. Men carrying swords stand in two lines or a circle, with a poet singing in their midst, and perform the traditional dance. Poetry is especially important to Arab cultural life, and has long been considered one of the highest expressions of literary art. In the days when the Bedouin were constantly traveling, poetry was primarily an oral tradition. People would gather around a storyteller, who would spin tales of love, bravery, chivalry, war and historic events. This was both entertainment and an oral preservation of history, traditions and social values. The Holy Qur’an took the Arab love of language and poetry to new levels. It exemplifies the perfect use of the Arabic language, and is considered to be the ultimate literary model. Poetry remains popular among Saudis today. They gather at cultural events, most notably the Jenadriyah National Culture and Heritage Festival, and avidly read the works of established poets that are printed in Saudi Arabia every year. There is also a popular televised poetry competition.